Chef, restaurateur and author Scott Conant of Food Network TV’s popular Chopped delivers his warm and lively celebration of food to azcentral Food & Wine Experience (azcentralfoodandwine.com) Sun., Nov. 6, with an hour-long cooking demonstration on the Grand Tasting main stage for all patrons to enjoy, creating a veritable foodie party. The event runs Friday through Sunday, Nov. 4-6, 2016, at Salt River Fields at Talking Stick. Conant fans best act quickly on this limited availability VIP Grand Tasting ticket. A similar package with Mario Batali for Sat., Nov. 5, sold out in a week! Conant is a popular ‘judge’ on Food Network’s highly-rated Chopped, and also is a three-time acclaimed cookbook author and restaurateur known for his unwavering culinary passion for creating singular dining experiences with soulful food in a convivial atmosphere. His career spans nearly 30 years, including multiple restaurants, an enthusiastic following of fans and an ever-expanding brand. Indeed, he has established himself as one of the country’s top chefs, restaurateurs and a loyal following of all ages. What’s extra enjoyable Sun. Nov. 6 at azcentral Food & Wine Experience is Conant’s hour-long cooking presentation on the Monark SubZero/Wolf stage for all patrons, surely creating a fabulous foodie party atmosphere. 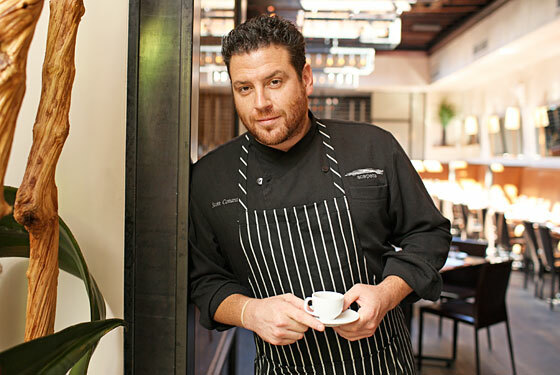 Scott Conant will also be signing books in the event footprint’s Luxury Pavilion. In addition to the newly opened Impero Caffè at NoMad’s Innside New York hotel, Conant also is the chef and owner of Scarpetta in Miami and Las Vegas, wine bar D.O.C.G Enoteca, and private event space, SC Culinary Suite in New York, boasting a sleek kitchen and space for intimate dinners and cocktail parties. Conant has appeared on the Today Show, The Chew, CBS’ The Talk, Live with Kelly & Michael and Good Morning America, and is a regular judge on Chopped, consistently one of Food Network’s highest rated programs. He also has published three cookbooks: New Italian Cooking, Bold Italian and The Scarpetta Cookbook. Chef Mario Batali, appears at the event Sat. Nov., 5. Batali is co-host of ABC-TV’s The Chew, author of 10 cookbooks and oversees 26 restaurants across the US and Singapore. In addition, throughout the two-day event, the lineup features Chef Kevin Fink of Emmer & Rye, one of Food & Wine Magazine’s “Best New Chefs 2016,” Michelin-starred and James Beard award-winner Chef Alex Stratta, Chef Bruce Kalman, one of few chefs to beat Bobby Flay in competition, and many more Arizona culinary leaders. Tickets are available at azcentralfoodandwine.com. Subscribers to azcentral.com and The Arizona Republic can access a special ticket by visiting azcentral.com/insider. 2016 Sponsors Include: azcentral Food and Wine Experience presented by Cadillac is sponsored by AJ’s Fine Foods, Monark Premium Appliances, SubZero/Wolf, City of Scottsdale, Hensley Beverage Company, Salt River Fields and Scottsdale Convention & Visitors Bureau.